A new book spanning the career of legendary rocker Alice Cooper will be published on June 13 in the U.K., and September 1 in the USA via Omnibus Press. 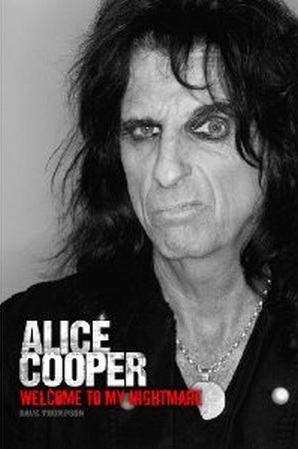 Titled "Welcome To My Nightmare: The Story Of Alice Cooper", it is written by Dave Thompson, who has many rock books under his belt. The book's official description: "Drawing from exclusive and unpublished interviews with a variety of names and faces from throughout Alice's career, the book follows Cooper's tale from his life growing up as a preacher's son in Arizona, through the early years of struggle in Phoenix and then Los Angeles, and then onto the roller coaster ride that has been the years since then. Includes interviews with original bandmates Michael Bruce and the lateGlenn Buxton, drummer Neal Smith, the late Frank Zappa, manager Shep Gordon and producer Bob Ezrin. Includes tributes and recollections from many of the artists who call Alice an influence - from The Damned and The Cramps, to White Zombie and GWAR. Session players and songwriters who have made their own contributions to the Alice story recall their days spent with this Prince of Hell-raisers. The result is a story that alternately thrills, shocks, surprises and delights. Includes full discography and bibliography." i wanna have a copy of this book.. anyone?